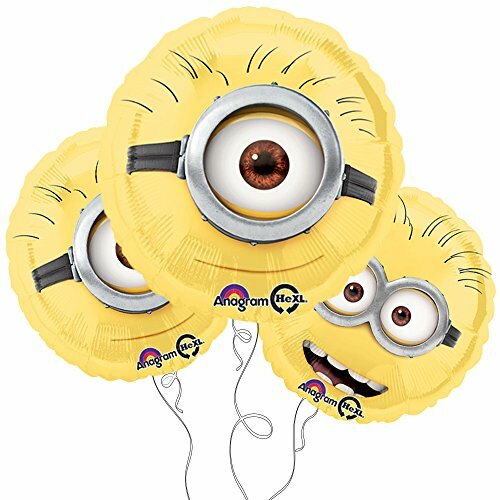 These 'Despicable Me' foil balloons have an automatic sealing valve. They can be filled with air so that they can be fixed to the wall or can be filled with helium so that they float. These balloons will come flat and not inflated with either air or helium, you must inflate this balloons yourself. The balloons are an ideal gift to a young child on their birthday, guaranteed to put a smile on their face! It could also be used as a fantastic decoration at your childs birthday party! 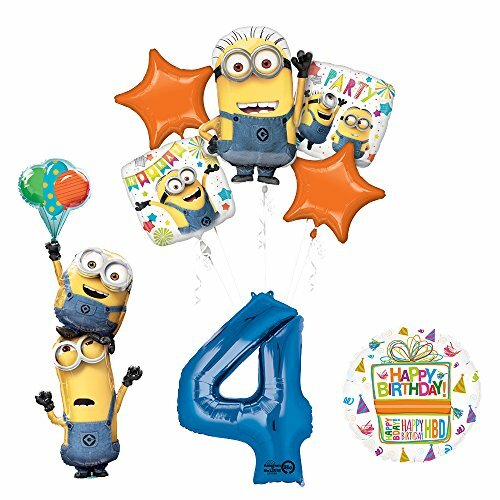 With this kit you will receive: (1) 61 inch Minions Stacker Foil Balloon, (1) 34 inch Giant Blue Number 4 Foil Balloon, (1) 18 inch Birthday Present Balloon, (1) 25 inch Waving Minion Foil Balloon (2) 18 inch Minion Square Party Balloons, (2) 19 inch Orange Star Foil Balloons. Just add Helium and ENJOY! 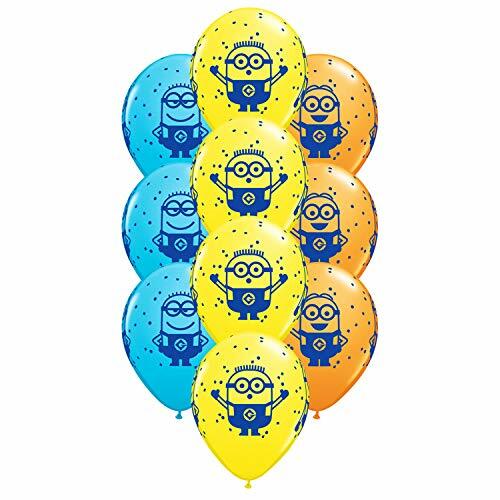 These Balloons are perfect for your little minion's next Party or Birthday! 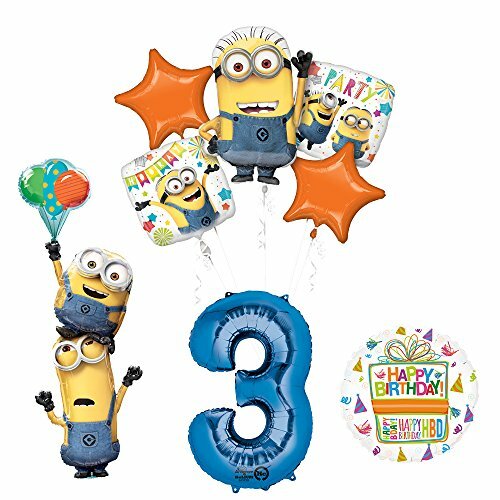 With this kit you will receive: (1) 61 inch Minions Stacker Foil Balloon, (1) 34 inch Giant Blue Number 3 Foil Balloon, (1) 18 inch Birthday Present Balloon, (1) 25 inch Waving Minion Foil Balloon (2) 18 inch Minion Square Party Balloons, (2) 19 inch Orange Star Foil Balloons. Just add Helium and ENJOY! 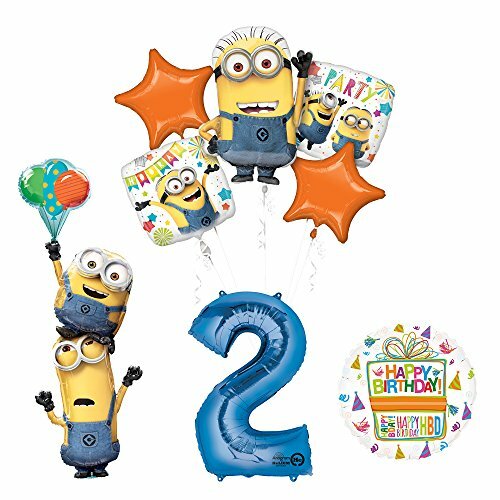 With this kit you will receive: (1) 61 inch Minions Stacker Foil Balloon, (1) 34 inch Giant Blue Number 2 Foil Balloon, (1) 18 inch Birthday Present Balloon, (1) 25 inch Waving Minion Foil Balloon (2) 18 inch Minion Square Party Balloons, (2) 19 inch Orange Star Foil Balloons. Just add Helium and ENJOY! As one as Amscan Internationals most popular party ware products, you can rest assured it will be of great quality, perfect for party planning and of innovative design. 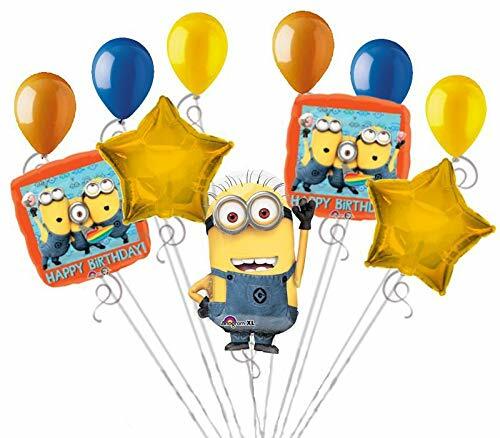 Included in this bouquet: 11 Balloons Total 1 - 30" Minion Steve Shape Balloon 2 - 18" "Happy Birthday" Square Balloons 2 - 18" Gold Star Balloons 6 - 12" Mixed Latex Balloons (2 Orange, 2 Blue, 2 Goldenrod) These items may arrive flat or in retail packaging All balloons sold online are shipped out with no air/helium. Filled balloons don't travel well through different elevations. All balloons are sold without ribbons. 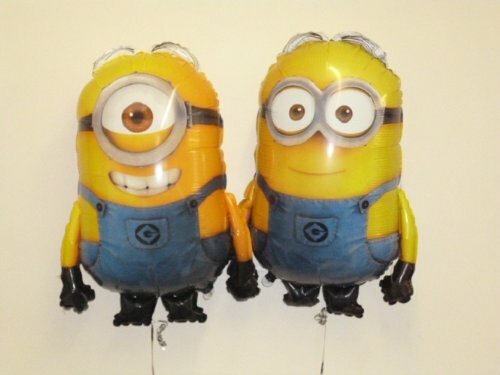 These balloons feature the minions from the Despicable Me movie franchise and are sold as a set of ten. Perfect for a children's birthday party! 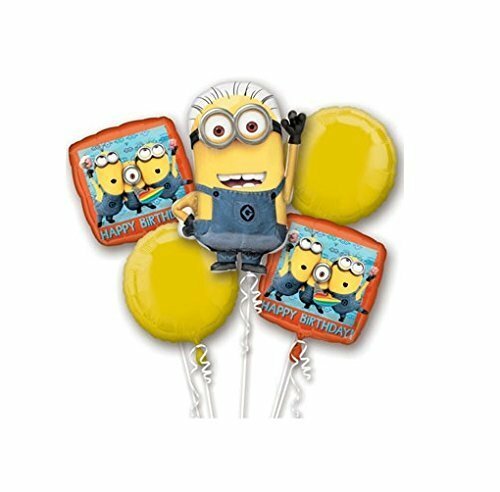 (16ct) Despicable Me 2 Minions Birthday Latex Balloons Party Supplies 12"
5 Set Bundle Minions Birthday Party Balloons Balloon Super Shape Despicable Me!